Ohhhh-ho-ho, do I have something gooood for you. After meditation this morning, I was hungry for breakfast. I spilled all of my almond milk yesterday, so a protein shake was out of the question. 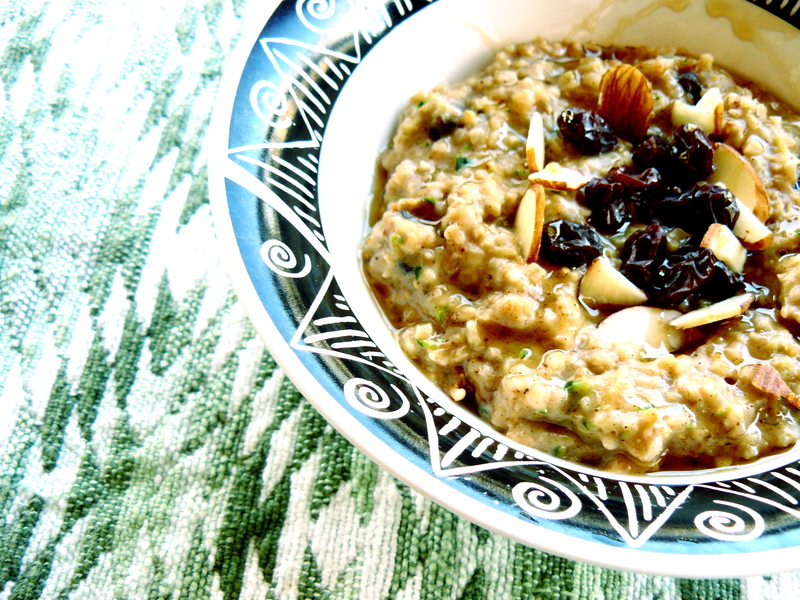 My second favorite breakfast dish, a hearty bowl of steel-cut oats, was the next best thing. 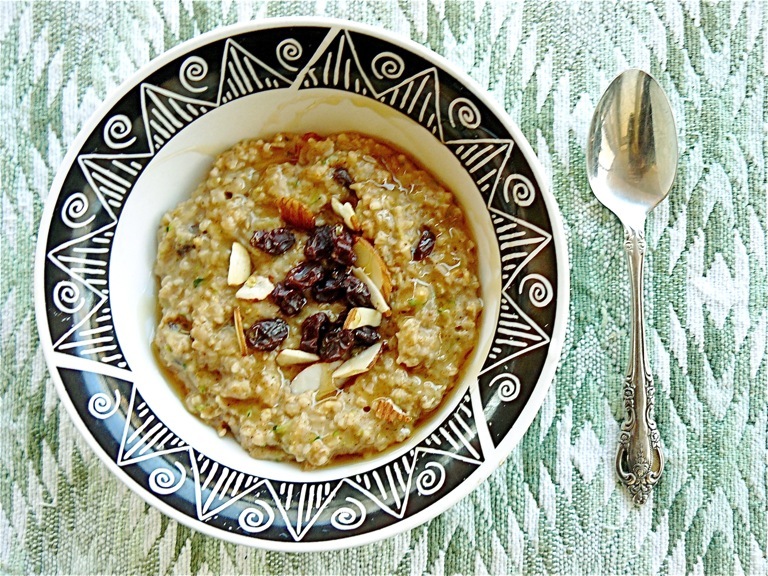 Naturally, I hopped onto FoodGawker to forage for a new oatmeal recipe to try. It’s clear that pumpkin oatmeal is the trend lately. I’ve had about twenty bowls of it so far this fall. And while it is delicious, warming, and seasonal – I’m getting sick of it! A few recipes jumped out at me. Apple Pie Oatmeal, Banana Berry Nut Butter Oatmeal, Rhubarb Baked Oats. In a small pot, bring the water and salt to a boil over high heat. Add in the steel-cut oats, lower the heat to simmer, cover and cook for 15 minutes, stirring occasionally. (I found I had to add in more water than the original recipe suggested occasionally to keep the oats cooking/prevent the bottom from scorching). 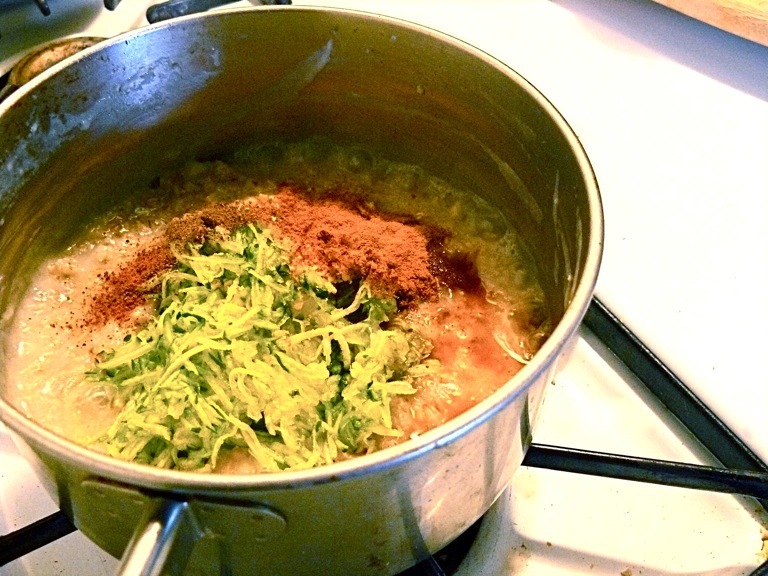 After about 15 minutes, add the zucchini, vanilla, cinnamon, nutmeg and ginger. Stir well, then cover again and cook for another 5-10 minutes (if oats are dry, add a bit more liquid). 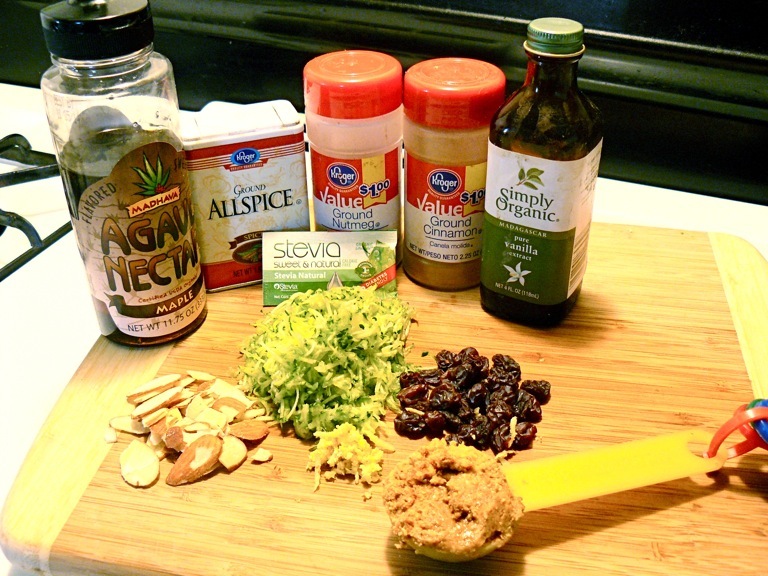 Remove from heat, stir in the almond butter, nuts, raisins, stevia, and a just a little bit of maple agave (save some for serving). Prepare yourself, and serve with a few more nuts, raisins, and maple agave on top. This is, without a doubt, the most delicious oatmeal I have ever eaten. The steel-cut oats and almonds add a soft crunch, mimicking the texture of baked zucchini bread. 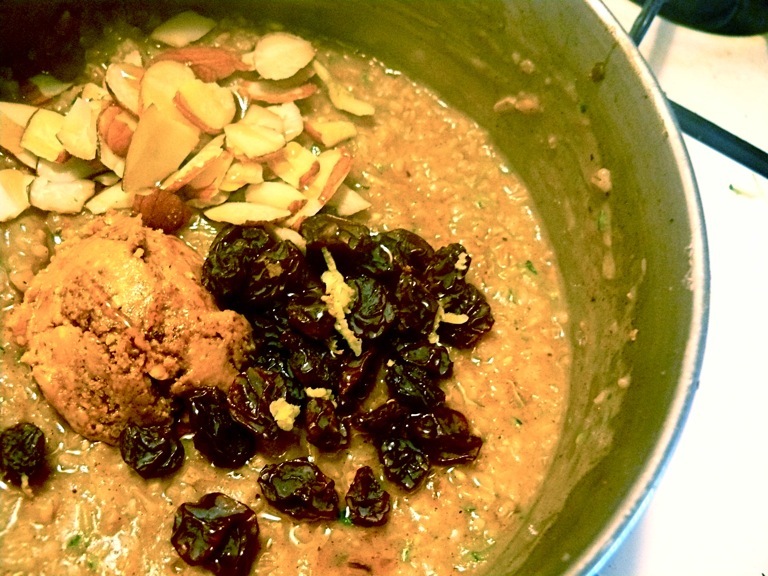 The sweetness of the raisins and maple agave really take this to another level. I am dreaming of my next adventure with this when I have almond milk, walnuts, and crystallized ginger. . . I think I gobbled this down in two minutes flat. If you want a unique, sweet, and seriously satisfying breakfast that’s sugar-free – this has gotta be it. This recipe is also a great alternative to heavy starches and breads in the morning that can make you feel weighed down. 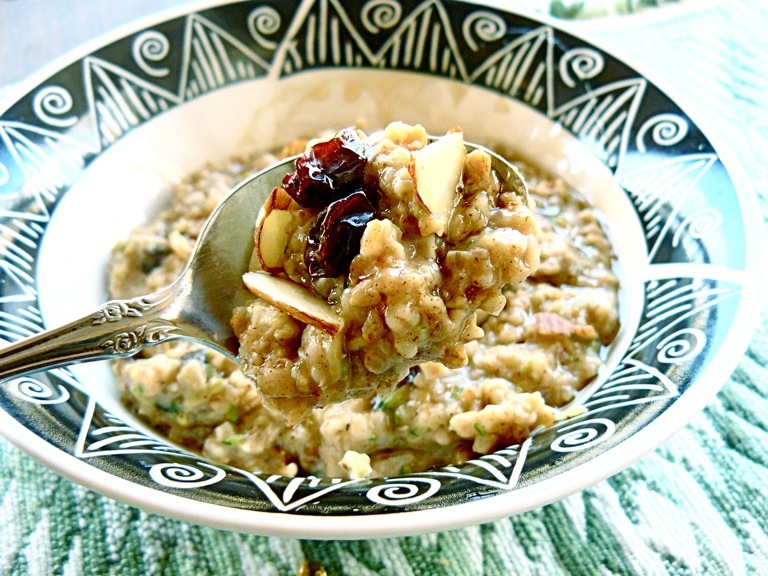 Oats are a great replacement, and serve as a backbone for fun experiments. I’m itching to try banana bread oatmeal after eating this. My mind is full of enticing possibilities. . .